Judwaa 2 is an Upcoming Bollywood Film in 2017, It is Comedy, Drama Film and Varun Dhawan, Jacqueline Fernandez in lead roles. This film is Directed by David Dhawan and Produced by Sajid Nadiadwala. It is made under the banner of Nadiadwala Grandson, Entertainment. 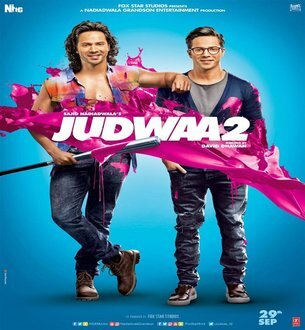 Judwaa 2 is scheduled to release on 29 September 2017. In the poster of Salman Khan's hit movie "Judwaa" Sequel 'Judwaa 2', Varun is seen moving out of the taxi in two different incarnations. In a look they are wearing simple and eyeglasses, their second look is Modern and Funky. In the film, romance will be seen with Varun, Jacqueline and Tapsee.